Retail developers Boxpark make bid to revive Victorian arches on Madeira Drive and create a People’s Promenade. 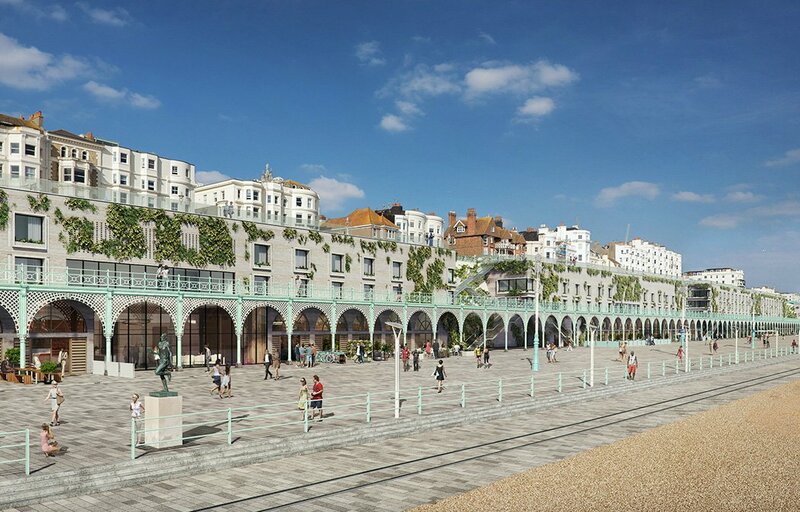 Retail and leisure development company Boxpark has released brand new CGI images of its Brighton Madeira Terrace development proposal – the ‘’People’s Promenade”. The images show the stunning reimagining of the renowned Victorian arches into a world-class, beachfront leisure destination, which the company claims would create green public spaces and make it easier for people to access Brighton beach via Madeira Drive. Retail units would also be accessible from the beachfront, with the aim to generate footfall from tourists and Brighton locals alike. The project aims to return Madeira Drive to its former glory, creating a vibrant hub of activity on the seafront, including a year round retail parade and food and beverage destination extending onto the promenade, as well as a world-class hotel development. The new building and urban green spaces would aim to substantially increase commercial performance, creating hundreds of jobs and encouraging international tourism to Brighton and Hove. The need for work along the Madeira Terrace is well-publicised, with Brighton & Hove City Council setting up a crowdfunder, Save Madeira Terrace, last year to restore the Victorian archways to their former glory. Though this successfully raised almost £500,000, the remaining costs are estimated to be around £20million – so an investment from Boxpark would hugely benefit the works. The new Brighton proposal is being led by Brighton and Hove resident and Boxpark founder Roger Wade, who has developed the plans alongside local architect Paul Nicholson from Chalk Architecture. The regeneration project would restore the existing Victorian arch structures, whilst retaining their architectural heritage and increasing commercial appeal for both locals and visitors. Boxpark is a Brighton-based retail and leisure development company specialising in creating spaces from refitted shipping containers. Currently thriving in Shoreditch and Croydon, Boxpark is set to open its latest site in Wembley Park in late 2018.